Resonance Technology offers a range of accurate patient responses measurement response tool for use during the MRI scan. All devices are fully MRI compatible and many can be programmed to replicate keystroke sequences. Features 4 buttons at the unit base, plus a redundant button on the top of the stick. All necessary cabling and drivers are included. Buttons are programmable in the PC mode only. 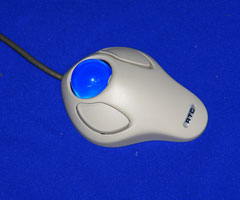 Features 2 buttons programmable in the PC mode. The device can be used to emulate a sequence of keystrokes. A dual mode PC/MAC version also is available. All numeric digits and math operators are included in this compact unit. It is ideal for one-button patient response. Resonance Technology is always adding to its advanced line of input devices and can also customize a device for you. Please contact us with your required specifications for a quotation.